Noise, is a form of oscillation of mechanical bodies at higher frequency than 20Hz. Noise is the unwanted form of sound that we hear. Interpretation of noise varies from one individual to another and very much dependent on the loudness of the sound. Sound is produced through vibration of objects and reaches our ears as waves (compressions and rarefactions) in the air or through other media. 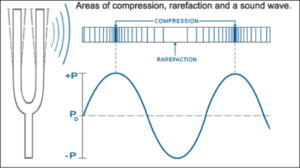 Air pressure generated by the vibration of the object changes into waves as they travel through the air to produce the sound. These air pressures variations are converted into mechanical energy by the middle ear, subsequently moving microscopic hairs in the inner ear, which in turn convert the sound waves into nerve impulses. Sound that is loud enough to damage hearing or caused annoyance is unwanted and, therefore considered to be noise. Outer ear modify acoustic wave received and directs it to eardrum. Sound will reaches the eardrum as air pressure variations. 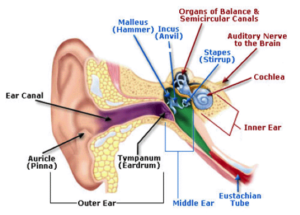 Air pressure vibrations being amplified by the ossicles in the middle ear and being transmitted as sound pressure to the inner ear. Hair cells in the inner ear will respond to the location of movement of the basilar membrane and activate the auditory nerve to transmit information to the brain. The brain will then interpret the information received as pitch and loudness. Noise can be largely classified into four types: continuous, intermittent, low frequency and impulsive. Continuous noise is defined as noise whose maxima (highest levels) occur more often than once per second. Such noise could come from factory equipment, heating or ventilation system. Intermittent noise is a mix of quiet and noisy periods that increases and decreases rapidly. Most manufacturing noise is intermittent (e.g. equipment that operates in cycles). Low frequency noise refers to noise below frequency of about 100 to 150 Hz. Such noise is also commonly referred to as infrasound. At these particularly low frequencies complainants often have difficulty in describing the source of their complaint, sometimes referring to “feeling the noise” or to “pressure sensations”. Impulsive noise refers to noise with peaks occurring less often than once a second, and is limited to peak sound pressure levels of 140 dB. The sudden burst of noise can startle an individual with its fast and unexpected nature. Impulsive noises can be created by construction equipment such as pole drivers. Industrialization: Many industries employ big machines that are capable of generating large amount of loud noise. In addition, industrial facilities usually comprise of compressors, generators, exhaust fans, grinding mills that can produce loud noise. Thankfully, large industries are located away from residential zone in Singapore. Therefore many of us are not subjected to the noise source from the industries. Poor Urban Planning: This is a critical problem in many developing countries. Congested houses, over supply of cars, limited parking lots, poorly maintained facilities and amenities lead to severe noise pollution in those countries. Social and Entertainment Venues: Noise is at its peak in many of the entertainment venues. Loud music being played in disco, multiple noise sources in the arcade games center and heavy chattering in casino are a few of the example of noise pollution. Transportation: The large number of vehicles on the roads and trains are the sources of noise pollution in a city like Singapore. Construction Activities: Construction of buildings, train stations, roads and housing renovations take place every single day. Within a packed demographic, any construction activity that take place in city will likely to introduce noise pollution and annoyance to the community. Neighborhood chores: The daily activities of doing household chores, running of town events and conducting of personal events (such as weddings and funeral) within the neighbourhood add noise to the environment. As population in Singapore increases, HDB flats get smaller and are built closer to one another. HDB flats are also built higher to accommodate more people. With the higher density of people within a confined area, more noise is going to be created. Noise is measured in unit of decibel (dB). Human ear is incredibly sensitive. We are able to hear a wide range of sound from fingertip brushing lightly over the skin to a loud jet engine that is 1 billion times more powerful. In terms of decibel scale, smallest audible sound stands at 0dB. A sound 10 times more powerful is at 10dB. At 100 times more powerful than the smallest audible sound, it measures at 30dB. Every 10 times incremental step correspond to a gain of 10dB and potentially 10 times more harmful. The scale runs to over 180 dB, which is equivalent to the noise generated from a rocket launched. Level (e.g., magnitude or loudness) of sound. Sound levels are measured and expressed in decibels (dB) with 10 dB roughly equal to the threshold of hearing. Frequency composition or spectrum of the sound. Frequency is a measure of the pressure fluctuations per second, measured in units of hertz (Hz). The characterization of sound level magnitude with respect to frequency is the sound spectrum, often described in octave bands, which divides the audible human frequency range (e.g., from 20 to 20,000 Hz) into ten segments. Variation in sound level with time, measured as noise exposure. Most community noise is produced by many distant noise sources that change gradually throughout the day and produce a relatively steady background noise with no identifiable source. Identifiable events of brief duration, such as aircraft flyovers, cause the community noise level to vary from instant to instant. A single number called the equivalent sound level or Leq describes the average noise exposure level over a period of time. Transient noise events may be described by their maximum A-weighted noise level (dBA). Hourly Leq values are called Hourly Noise Levels. Subjective effects of annoyance, nuisance, dissatisfaction. Interference with activities such as speech, sleep, and learning. Physiological effects such as anxiety or hearing loss. Loud noise can affect your sleeping pattern, which may lead to irritation. Without a good night sleep, it may lead to problems related to fatigue and health problem such as cardio-vascular disease and stress related heart problems. High decibel noise can also interfere in our daily communication that may lead to misunderstanding between two persons. Constant exposure to sharp noise can also lead to severe headache and disturb your emotional balance. There is good evidence, largely from laboratory studies, that noise exposure impairs performance. As noise is sensed by the hearing organ, loud intensive noise may result in a proportional reduction of sensitivity of the hearing organ depending on the duration and intensity of the noise. If the noise persists at an intensive state, an irreversible loss of hearing (Bradyacusia) may occur characterized by a constant varying threshold. A continuous eight hours of 90 dB noises can cause damage to the ears. An exposure to a 140db noise will result in immediate ear damage. Any noise that affects the audacity of a conversation and resulting in the need to raise the voice often serve as a rule of thumb that the noise is too loud (~85dB) and can possibly cause hearing loss. To find out more about the facts of hearing loss, refer to here. Background or low-level noise often disrupts people’s concentration and affect their learnings. Research has suggest that noise-induced stress may decrease dopamine in the prefrontal cortex (where the hormone controls the flow of information from other parts of the body). Stress resulting from the background noise may then decrease brain functioning and thereby impairing learning and memory. A study conducted at the University of Wisconsin-Madison by Brianna T. M. McMillan* and Jenny R. Saffron found that too much noise can affect children both cognitively and psycho-physiologically, as seen in more negative school performance and increased levels of cortisol and heart rate. By reducing background (e.g. turning down the volume of home entertainment system) or highlighting important information, it can help children in learning even when there is background noise. For individual subjecting to noise nuisance or pollution, ear-protection aids like earplugs and earmuffs, can be used to reduce noise exposure. Acoustical tiles, hair felt, perforated plywood can be fixed on walls, ceilings and floors to reduce noise. Sound insulation can also be achieved through fixing windows with double or triple panes of glass and filling the gaps with sound absorbing materials. Sound absorbing materials can be fitted onto jamb frame gap between door and wall to impede sound from traveling through the cracks or gaps. Strict and effective noise regulations need to be enlisted and enforced to curb the menace of noise pollution. Individuals or businesses that create noise output above the regulated noise level should be reported to the relevant authorities to be dealt with. Noise measurements and recordings can be taken at the respective site to be submitted as possible proof of the noise nuisance or pollution created. Refer to our noise nuisance recording service page for more information. © 2019 Noise Nuisance Control Products | Dropnoise. All Rights Reserved.